UPDATE: We have our winner: Brooke Scott. Please check your email on how to claim your prize. Thanks to everyone who entered! Always on the go? Simplify your beauty routine with the Real Techniques Travel Essentials Set. 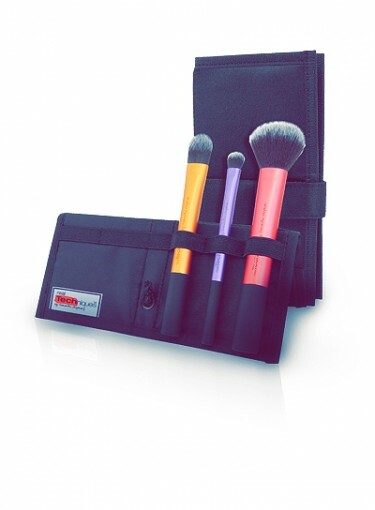 The set includes three full-sized brushes — essential foundation brush, multi-task brush, and domed shadow brush — which all come in a sleek fabric, panoramic case perfect for stowing away in your suitcase. Each brush is made with 100 percent cruelty free ultra-plush taklon bristles, and a unique color-coded system corresponds to the key steps of application to help you look perfect in any light. The Prize: One winner will win a Real Techniques Travel Essentials Set of three full-sized makeup brushes. To Enter: All you have to do for your chance to win is to fill out the sweepstakes form on our Facebook Page. The Deadline: The contest will run from Monday, July 23rd to Friday, July 27th. We will pick the winner at 12 p.m. on Friday, July 27th. Good luck! US only; contest not valid for previous giveaway/caption winners.